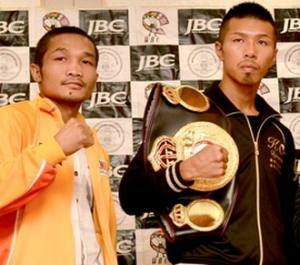 Filipino Michael Farenas of Gubat, Sorsogon will wage the fight of his life as he battles undefeated hard-hitting WBA super featherweight world champion Japanese Takashi Uchiyama today (July 16) in Kasukabe, Japan. For the tall, fast, power-puncher champ Uchiyama, 32, the fight will be his 5th world title defense. He captured the world title by knocking out dangerous Mexican Juan Carlos Salgado in January of 2010. In his last title defense Uchiyama (18-0, 15KOs) brutally stopped Mexican former titlist Jorge "El Coloradito" Solis on new year's eve in Yokohama. Meanwhile, Farenas (34-3-3, 26KO's), an experienced southpaw handled by former 2-division world champion Gerry Peñalosa, comes from a narrow split decision win over Jason Egera (17-8, 8KO's) at Barangay Centro, Mandaue City, Cebu. Being the smaller fighter, Farenas will have to look for close quarters short distance combat with good speed while reaching into his experience and skills to score blows (no low blows hopefully) on Uchiyama, a fighter known for his devastating fists. Making good use of his southpaw stance, Farenas should rotate to the left of Uchiyama to avoid the Japanese's fearsome right hooks and straights, two of his lethal weapons of war. A constant feet and head movements are essential as Farenas must not be an easy target for the violent damaging harpoons thrown by the Japanese. Tall and strong fighters like Salgado and Solis have gone toe-to-toe with Uchiyama and succumbed by KO. But Farenas can succeed with a good in-fight technique and fast feet. Plus, Farenas, 28, is strong and can take some punches and his punching power is decent. In his 41 fights against all kinds of fighters in different parts of the world Farenas has never been knocked out. Yes, Farenas has visited the canvas as in his fight with Korean Jae-Bong Jang at the Cuneta Astrodome in Pasig City. This author was present and it was wild seeing Farenas down and down again. But Farenas managed to collect himself, cleared his dizzy head and scored a triumph. Amigos, these days in our sport of boxing, we are all seeing how huge "underdogs" score amazing wins. Previously unknown super lightweight Josesito Lopez knocked out the popular well-known and heavier former welterweight champ Victor "Vicious" Ortiz, beating him up and breaking his jaw. As a result Lopez will battle "Canelo" Alvarez for the Jr. Middleweight title. Amazing, right? Over the weekend Danny Garcia was supposed to be ran over by the famous "super" world champion Amir Khan. Instead, it was Garcia who destroyed Khan giving the Briton the biggest pounding of his career. Just last March, Farenas's fellow Filipino Sonny Boy Jaro, violently broke down the "WBC's Fighter of the Decade" Ponsaklek Wonjongkam. Boxing is full of amazing stories and Cinderella men who rose to the occasion and conquer a world title and this is now Farena's chance, his moment of the truth. Let's see how he performs. Some fans jokingly call him "Low Blow Farenas," while others think that in his whole career Farenas fought mainly patsies. Egera was suppose to be a tune-up fight and some fans, including a judge saw Farenas losing the combat by 4 points. So against Uchiyama he is way out of his league? That's the opinion of some. These and many other opinions can be expressed on any boxer and any fight, but in his one, there is a truth everybody agree: today's fight against such a formidable enemy fighting in his home country will be an extremely difficult match for Farenas. Then, he will have to make his perfect fight. One awesome fight as never before in his life. This is the right time. It will be difficult, but in our sport of boxing nothing is impossible.